I have a previous review of WA here. That review is the reason that I am blogging now. I found some super expensive programs out there that would not tell me what I would get for my money. I did my best to compare apples to apples in that review. This review focuses more on the massive amount of benefits to belonging to this University. It is not just education, but a whole suite of helpful tools that are INCLUDED in the membership. – It is a step-by-step training program with 120 lessons in all, that teach you how to set up WordPress to get started blogging, an introduction to the WP back office, and installing plugins. Learn at your own pace so that you can implement the training while you keep your 9-to-5 gig. – It is 52 live video classes a year on a variety of subjects like proper SEO, email marketing, style elements and writing reviews. – It is an education in monetizing your website at the optimal time. 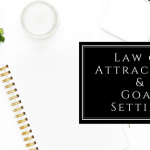 Learn how to add affiliate links to your website and how to promote those links in your blog posts for optimal conversions. – It is a community of fellow affiliate bloggers who are various stages of expertise and are willing to help anyone in the chat area. 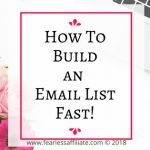 We have people who have been blogging for 15 years, and many of our Ambassadors earn 6 figure incomes from blogging, so there is a lot of help from people who know what they are talking about. – It also has the best site support that is 24/7 and quick to respond. – Write your blog posts in Site Content writing platform and have the benefit of the “Plagiarism Checker” to help you avoid having duplicate content. Site Content also comes with 1,000,000+ FREE images that you can use. – A get-rich-quick made-for-you funnel system. – Expensive. WA is $49 a month if you pay monthly or $359/year which divided by 12 = $30 a month (including hosting and free WordPress setup!). Quit anytime. Click this link to see all of the benefits of paid membership versus the free membership. Along with the rest of their main team, KC, Aaron, and Jay (who does the live videos on Friday evenings) they have worked together to create an affordable way for anyone to get the education that they need to start a business with their own website. There are two separate programs within Wealthy Affiliate. The Core program teaches how to get started with your own niche website, and progressive steps to setting up various aspects of affiliate marketing including separate components for social media engagement and content creation. You get 50 lessons. The second program is the Affiliate Bootcamp, which specializes in teaching the various aspects of monetizing your website with affiliate product links. You can also promote Wealthy Affiliate as your first affiliate product (not mandatory). It is an option to better learn the ways of affiliate marketing by giving you an excellent product to promote immediately. You get 70 lessons in Affiliate Bootcamp. You DO NOT have to be an affiliate for WA; you can apply the training to any niche. Many WA affiliates have other niche websites and promote WA on all of them, or only one. It would be up to you. You are encouraged to complete the main program first, but if you have prior knowledge of building a website and developing quality content, you can jump right in to Bootcamp. One of the nicest things about WA is the age range of the students. There are many teenagers as well as many seniors and people from all backgrounds, ethnicities, and niches, and age groups. There is a feedback section that allows you to gain credits for giving other websites feedback that they have requested. When you give feedback to two other websites, you gain enough credits to ask for feedback. Getting feedback from a “fresh pair of eyes” is so helpful especially for people who are new to starting an online business. The Chat area is the fastest way to get the help that you need. If someone in chat cannot help you fix your problem they will direct to you to talk to Kyle, Carson, or support. In the chat area you will also find people who can give you tips and tricks for promoting your blog or website, comparison prices and feedback for other hosting, and general knowledge from people who “have been there”. This is invaluable. 25 free website as well as hosting for 25 of your own domains (you have to pay for the domains. $13.99 each per year). Also WHOIS protection/privacy (for your domain name) and advanced DNS automation (DNS is like the phone book for domain names). Access to all the training modules including Bootcamp. After three months of premium, you can start creating tutorials for WA and earn credits which are transferrable to cash. Your website is always there, with full redundancy. WA has a “mirror” of your website running at all times, so if your website were to go down, there is a copy of it available. Several layers of security to block spam and hackers before they get to your site. As well, your website is backed up every 24 hours, and can be restored by the support team. WA is Managed WordPress hosting, 30G of website space and bandwidth for 500k visitors a month. It also comes with unlimited email accounts and SSL for website security. The free account comes with 2 free sub-domain websites, live chat, a personal blog, and starter training (10 lessons). Free accounts Do NOT have access to the website/wordpress 24/7 support or mentoring from Kyle and Carson or the personal onsite blog. This level of membership is perfect for people who are not quite sure that online marketing is what they want to do. After you complete the first 10 lessons and set up a website, you should know if you have the desire, the time, and the motivation to add creating an online business in to your life. If you choose to proceed (and I recommend that you do! ), you can upgrade your free account to premium and get the first month for $19. 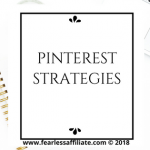 I have other bonuses if you choose to sign up through my link, including links to specific helpful videos for new bloggers, as well as help in pinning down your niche. Paying for you first year up front makes Wealthy Affiliate a very affordable affiliate education. Jaaxy – The ultimate keyword tool! I have a review of how Jaaxy is now integrated into the WA platform, with various benefits based on your membership level of WA. You can read that review here. 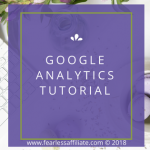 Jaaxy is a powerful tool that not only helps you search for appropriate keywords, it also includes the Alphabet Soup technique as well (your keyword + a, your keyword + b etc) which is not only helpful for finding keywords, it also helps to find blog post ideas. 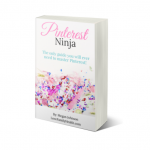 You can check your blog post rank on Google, brainstorm post ideas using Google Trends, Alexa Topics, and Twitter Trends as well as check out the bestsellers on Amazon. And it also has an affiliate program of its own! Jaaxy starter comes free with the free WA account. You get 30 free searches. If you upgrade to Premium then you automatically upgrade to Jaaxy Lite (unlimited searches). This is a benefit for all members of Wealthy Affiliate and that is the ability to start earning decent commissions right away. I earned my first two commissions in my first month, four in my second month and that is when I also started receiving the recurring commissions as well. Your mileage may vary. That was with a brand new blog, and I was brand new to blogging. No previous experience and I was still going through the early stages of training. Many people will say “I earned $2000 last month with my brand new blog”. 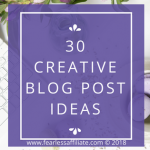 What they do not tell you is that they have been hobby blogging for a few years, or that they have several blogs and 10 years of experience monetizing blogs before they started this brand new blog. 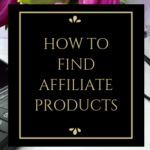 WA affiliate program has tons of banners and promotional materials that you can use to make promoting it easier. If someone signs up for any of the offers ($19 first month, premium upgrade or yearly pay) then affiliates earn. There are pretty decent commissions at almost 50% for premium and 25% for free members. There are many members who are earning a good living from promoting WA, with commissions that are available every month and all year long. Unlike some programs that only open up once a year, you have the ability to earn monthly and scale those earnings based on how you promote WA. If you get 300 paid referrals you also get a paid trip to Vegas! Ya baby! Kyle and Carson pick up the tab for you to attend the yearly WA private conference. You get swag, food, entertainment and some WA brainstorming! You also get some cash for gambling or whatever you want to spend it on. This year everyone hung out at a penthouse in the MGM Grand! Nice perk for an affiliate program, no? – It is inexpensive. Seriously, blogging education that includes hosting for $30 a month? – All the perks of Managed WP hosting at a much less expensive price than the competition offers. – A huge community of people to help you in the live chat area. Beats waiting on an answer in a Facebook group. 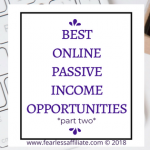 I could go on and on, but the point of this review was to point out some of the benefits to Wealthy Affiliate membership that you may not be aware of. You do not need to sign up to someone else to get your domain, and another company to get your hosting. 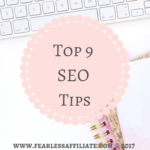 You do not have to go searching for images for blog posts or worry about being penalized by Google for duplicate content. 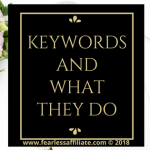 You do not have to leave the program to search for keywords. You have a quality affiliate program that pays well. I will say that I was totally shocked when I got my first commission just three weeks into my membership with Wealthy Affiliate. It gave me the incentive to keep going and keep working towards improving what I was already getting success with. I earn better and better commissions every month! My blog has evolved in this past year, to focus more on helping new bloggers and less on the reviews of other programs, but I keep the reviews on there so that people know that there are some pretty unethical programs out there. You do not need to spend a fortune to get a quality education in the ways of blogging and affiliate marketing. You do need to shop around and compare apples to apples, so that at the end of the day you feel like you have learned something that can help you in your life. If you have any questions about the WA program or if you are unsure whether you want to start a monetized blog and need some questions answered, I am here to help. 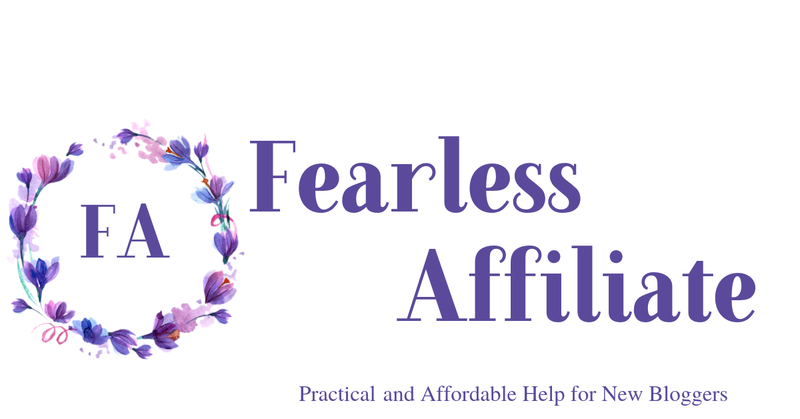 Leave your comments in the comment box below or email me at support@fearlessaffiliate.com. 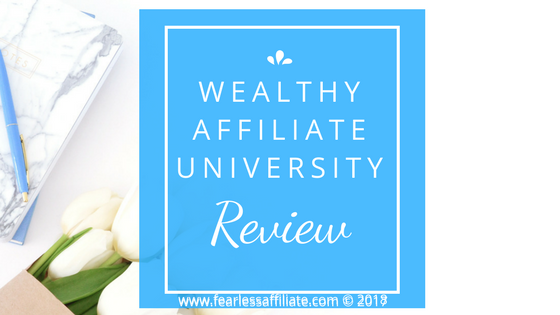 Wealthy Affiliate University is a brilliant program! The level of access to knowledge and an even better community can never be faulted! I have found so much success with this program within a short amount of time that I’m glad I joined it for such reasonable costs. I agree! I am finally doing the work that I was meant to do in this life and I know that I can recreate my success at any time if I ever need to. Freedom at last! Thank you Gerald and thank you for visiting today! Great review! Indeed Wealth Affiliate University is the best ever. I call it (Step by step dictionary of Affiliate Marketing). I am also happy for you that you had a commission with WA in just in three weeks…Bravo! You must be doing the right thing. I am yet to make sales, but I am definitely working towards it. Good job. Thank you Dorothy Okoye and thank you for visiting us today! Great idea! And that is a really awesome way to describe Wealthy Affiliate! In my words, wealthy affiliate is the total package for online success. When you hear of the many success stories that come out of this community you know that this is a program that is worth being a part of. All you need to build an online business is in the teaching of wealthy affiliate. I would encourage anyone to become a part of this amazing community that is making a big difference in the lives of so many people. You most certainly broke down what Wealthy Affiliate is in a way that is easy to understand and will entice people to join up. Very good job! Thank you Mike and thank you for visiting us today! Fantastic review! I can say as a fellow Wealthy Affiliate member that I have been thrilled since joining as a premium member. I am glad you have put that it isn’t a get rich quick scheme, it’s a work your backside off scheme as any work that makes you successful is. The difference is you get to talk about the things your passionate about, choose your hours and work from anywhere you like. Hi Andy and thank you for visiting us today! I agree, on all of your points. There is a lot of hard work, but unlike my 9-to-5 job, I actually enjoy going to work daily on my blog!